We were out for desserts and so I gave this place a try last night. I came in about 15 minutes to closing and their selection was limited since they've sold out on most of the items. However, the display case I saw for the desserts was small to begin with. In fact, standing in front of this 4 feet high by 3 feet wide case, we saw that half of the selection were savory items, like cold seaweed, chicken, etc. I suppose I was expecting and assuming this to be a dessert-centric place by what everyone has said about it. I should have read more carefully and deduced that it wasn't; my optimism preceded me. So I came in thinking that my search for a cool place to get dessert after dinner (that wasn't Cold Stone or Baskin Robbins) was finally at an end. It was obvious as soon as I walked in the door, however, that my search continues. My friends were also a bit disappointed at what they saw at Phoenix, since I had described this place to them as "a new place to get desserts." I admitted to them that I was just as surprised. We were expecting more of a J&J bakery or something like it. The fact that the attendants gave us a dessert menu, while we were standing right in front of their entire selection was kind of funny. My girlfriend saw that they offered mango pudding on their menu, but immediately saw that they were sold-out of it in the display case. For verification, I asked them if they had it, and to no surprise, they said no. All they had left, they said, we saw already. At this point, I smiled and gave the menu back to the attendant. "I guess we won't be needing this then." My girlfriend, who was craving dessert, was especially put off when she saw that the custard she wanted was stored right next to the cold chicken feet. Suffice it to say, she promptly lost her craving. Don't get me wrong, however. She's not squeamish. This is a girl who is no stranger to "balut", but I couldn't agree more with her that a dessert loses a bit of its appeal when its stored right next to poultry. I was prepared to give up at this point, since it was obvious that none of my friends really wanted anything anymore. But out of courtesy for the kind attendants, I took a pudding sampler to go. It had rose-longan jello, taro and coffee pudding, and some other pudding with grainy ingredients in the center which I could not identify. We took it back home to eat it. The rose-longan jello was nice. It was like eating a rose petal, an interesting sensation. The taro pudding was okay too, but not great. All the puddings however, were a bit too firm and was very light in taste; not very sweet, and really, not very anything at all. All in all, not bad for $3, but not exactly what I was expecting. I, however, did take some amusement in the fact that perhaps at every bite my girlfriend took of the pudding, visions of chicken feet danced in her head. Had a fantastic experience yesterday at the Wat Thai Temple's Loy Krathong Festival. I've been to the usual food court they have on weekends, but this was something special. Thanks to Curt for the heads up post last week. 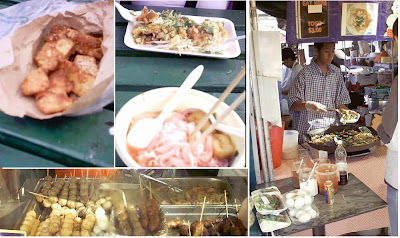 There were food vendors galore, selling everything from pad thai, noodle soups, satays, and durian ice cream. There were things I haven't seen or heard of before. The music, the aromas -- it was like being transported to Thailand; we felt we weren't in the Valley anymore! 1. We started with a tasty fried dish of wide, flat rice noodles stir-fried with dark soy sauce (and fish sauce) with greens and chicken. Noodles were chewy and had a nice bite; the greens were still crunchy and fresh. 2. Chicken and pork satay. Sweet with a nice barbecue char around the edges. Would've been killer if they came with a peanut sauce. 3. Shrimp ball stick. Delectably shrimpy, kind of like dim sum on a stick. 4. Mussels fried with glutinous rice flour and egg, on a bed of bean sprouts. This is a textural dream -- crunchy caramelized fried edges, chewy, with seafood flavor all complemented with the freshness of the crisp bean sprouts. 5. Seafood rice noodle soup, with slices of fish cake, some crunchy white fungus, and bits of fried tofu. The broth was a light pink from the sweet and sour chili sauce they put in. Delicious and refreshing with a little bit heat. 6. Crunchy battered fried bananas, taro and sweet potato. 7. Kanom krok. Tasty, small morsels of pan cooked batter made of rice flour and coconut milk. Amazing combination of sweet and savory flavors. NOTE: AS OF AUGUST 12, 2007, THE WAT THAI TEMPLE NO LONGER HOLDS ITS WEEKEND FOOD FAIR.